Good. 1st class post to the UK, Airmail worldwide. Robust packaging. 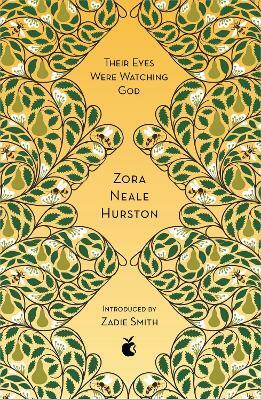 "Their Eyes were Watching God" is the most famous novel of the African American novelist and anthropologist Zora Neale Hurston (1891- 1960) and a classic of American literature. Written in 1937, the novel languished in obscurity for many years before it was rediscovered by scholars and by American feminists. The extent to which this book is feminist in orientation is debatable. The novel resists easy categorization. Janie was the product of a nonconsensual union between her mother and a schoolteacher, and she was raised by her grandmother who, when the girl is 16, decides she needs to be married. Her first marriage, arranged by the grandmother, is to Logan Killicks, an elderly farmer who owns 60 acres. Janie leaves Killicks after about one year and runs off with Jodie Stark, an enterprising young man who rises to become a wealthy property owner in Eatonville. After a stifling marriage of about 15 years, Jodie dies. Janie falls in love with a rostabout and gambler named Tea Cake, at least 12 years younger than she. The couple move to the Everglades and work in the fields. They sing, gamble, play, and are happy. Janie has a fulfilled, sensual marriage at last in which she feels she is wanted and treasured. "Two things everybody's got tuh do fuh theyselves. They got to go tuh God, and they got tuh find out about livin' fuh theyselves". "Their Eyes were Watching God" is an extraordinary novel about a person, about love, and about community. I first read this book several years ago for a book group and posted a review on Amazon's American site. I have reread the book for a club devoted to "Black Voices" and took the opportunity to write a fresh review and post it here. The book will bear repeated readings. This book is a great read, I'm glad that this has a movie based on it. The book was in my house as fast as expected in excellent conditions. it is great to see a portrait of another strong woman, and how she overcame adversity to find true love. This book follows the life of independent Janie Crawford as she searches for a community where she can find love, acceptance, and fulfillment in a culture that is suppressive to both women and African-Americans. Zora Neale Hurston is an underappreciated author; this work shines in both its writing and its portrayal of a strong heroine and a cast of equally dynamic other characters.